Whether you’re a coder with a conscience or a complete computer novice, pick up this book. Part instruction manual, part social exposé, Artificial Unintelligence is Meredith Broussard’s battle hymn for a better, and more just, technological world. It is a manifesto against technochauvinists – people, Broussard explains, who believe that technology holds the answer to all human problems. Broussard herself, a data journalist with some serious software development chops, does not. Via a series of adventures in coding – including an unsettling ride in a driverless car, using machine learning to predict which passengers survived the Titanic’s sinking, and creating a pizza-calculating app on a cross-country bus ride – she shows her readers how computers can get it right, but also what happens when they get it very, very wrong. 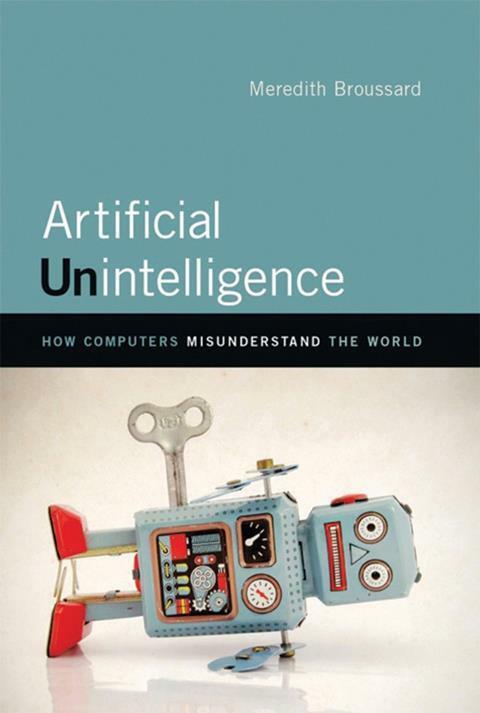 The author is an excellent storyteller, and has a knack for taking topics such as coding or AI and breaking them down using examples. Her faith in her reader is gratifying, entreating us to pay attention to how technology is used around us (though not necessarily for us). Broussard’s argument is beautifully simple. Computers are amazing machines that enable us to do incredible things with mathematics. They are also, ultimately, tools. Computers are not intelligent. People are – and even the most sophisticated computer program has someone behind the code – a developer, a programmer who tells it what to notice and what to ignore. It’s this human factor that we ignore at our peril. It’s no secret that the tech industry has a diversity issue – taking a deep-dive look into the history of its development and innovation, Broussard scrutinises the roots of the industry’s problem and follows it back to the way our technology has been built to the anthem of ‘move fast and break things’, and how women and minorities in tech have been systematically excluded to leave a small pool of elite white men at the top of the pole. Intuitively we understand that this isn’t equitable; further insights into the US criminal justice system and a biased piece of selfie-rating software provide concrete examples of why this is bad news for everyone. Woven through Broussard’s writing is the idea of ‘algorithmic accountability’ – auditing the algorithms that increasingly make decisions for us, and assigning responsibility when things go wrong. We have to get better at demanding that not only does our tech work well, but that it’s just and fair for everybody. This slim volume is a fast and fascinating read that will leave you bursting with questions and fizzing with excitement for the future of technology – one in which you, the human, will have just as much of a role to play as the machine.